Mysterious selkies, bad-tempered giants, devious fairies and even Loch Ness’s most famous resident – these are the mythical beasts of Scottish folklore. 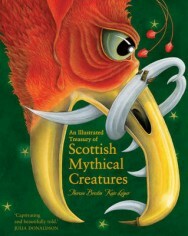 Alternately humorous, poignant and thrilling, each story is brought to life with exquisite illustrations by Scottish fine artist Kate Leiper. Loch Ness is an ideal place for a monster. It is so deep that it has more water in it than all the lakes of England and Wales added together – so who knows what might be lurking in a cave far below the surface? There is a record of a massive beast terrorising the folk who lived near Loch Ness when St Columba of Iona was visiting the area. The people there, who spoke Gaelic, named it Niseag, which became ‘Nessie’ in English – the name by which our monster is now known all over the world. McKenzie resolved not to mention the monster to anyone. Folk did gossip about seeing monsters but few believed these stories. If he told of what he had seen, people might laugh at him. Or, if they thought his tale was true, they might hunt the monster – out of fear or for food. They definitely wouldn’t be happy with what he was doing, which was dropping some fish into the water whenever he passed that spot in the loch. Later that same winter, McKenzie was on his route to Inverness one evening when a storm blew up. The wind strengthened, and hail beat in his face. He had no passengers on board, and he was glad of that, for the boat was heaving as the heavy current dragged it along. Using all his strength McKenzie grasped the tiller to guide his boat. If he didn’t deliver his cargo of barrels and boxes to Inverness he would not be paid. The waves grew stronger and pounded against the hull as he tried to hold his boat on a steady course. Then a freakish gust struck. The boat spun out of control, and with a horrible grinding tearing noise, the rudder broke off!